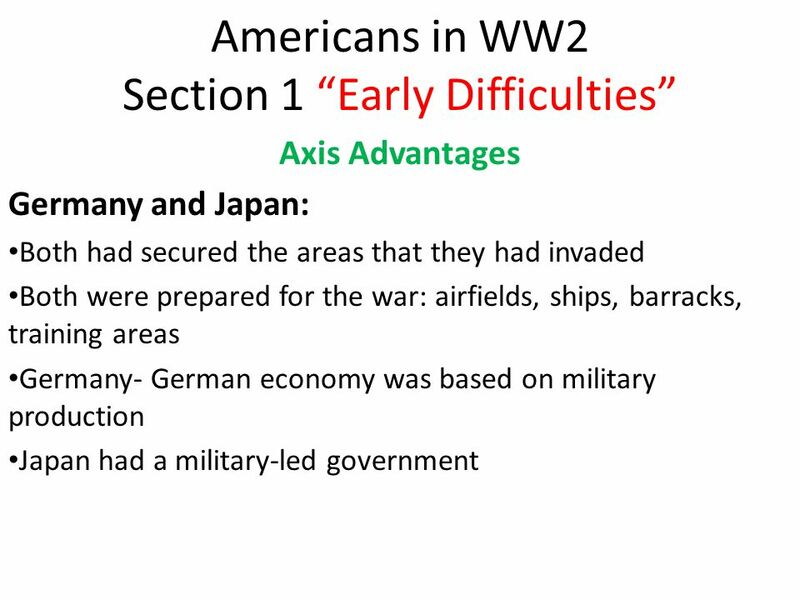 Americans in WW2 Section 1 “Early Difficulties” Axis Advantages Germany and Japan: Both had secured the areas that they had invaded Both were prepared. 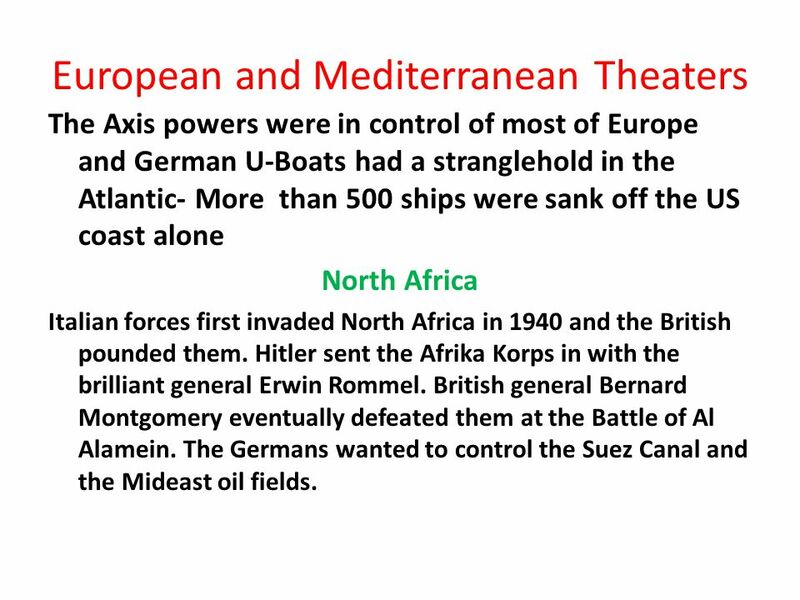 10 European and Mediterranean Theaters The Axis powers were in control of most of Europe and German U-Boats had a stranglehold in the Atlantic- More than 500 ships were sank off the US coast alone North Africa Italian forces first invaded North Africa in 1940 and the British pounded them. Hitler sent the Afrika Korps in with the brilliant general Erwin Rommel. British general Bernard Montgomery eventually defeated them at the Battle of Al Alamein. The Germans wanted to control the Suez Canal and the Mideast oil fields. 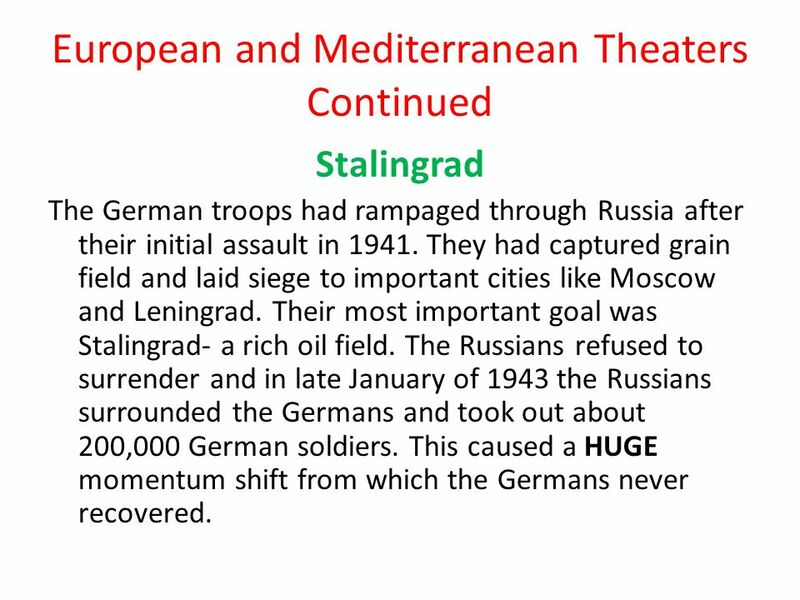 11 European and Mediterranean Theaters Continued Stalingrad The German troops had rampaged through Russia after their initial assault in 1941. They had captured grain field and laid siege to important cities like Moscow and Leningrad. Their most important goal was Stalingrad- a rich oil field. The Russians refused to surrender and in late January of 1943 the Russians surrounded the Germans and took out about 200,000 German soldiers. This caused a HUGE momentum shift from which the Germans never recovered. 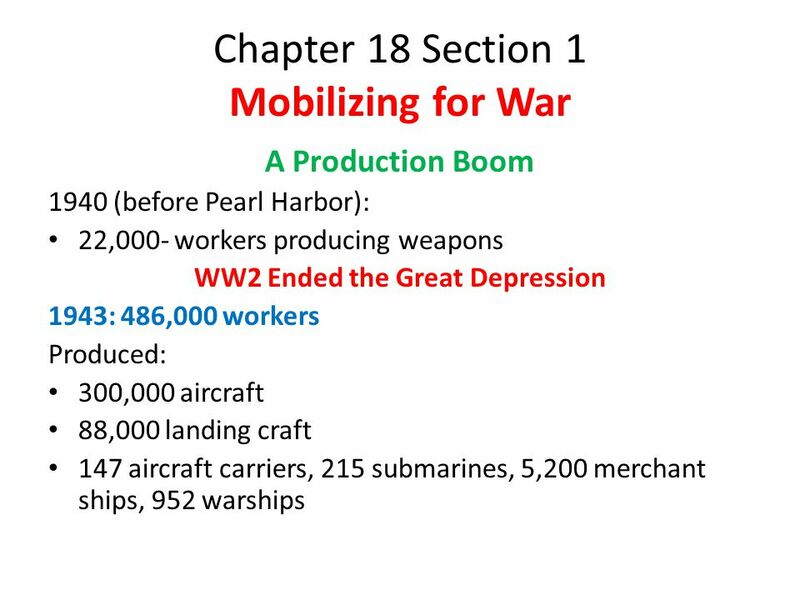 Download ppt "Americans in WW2 Section 1 “Early Difficulties” Axis Advantages Germany and Japan: Both had secured the areas that they had invaded Both were prepared." 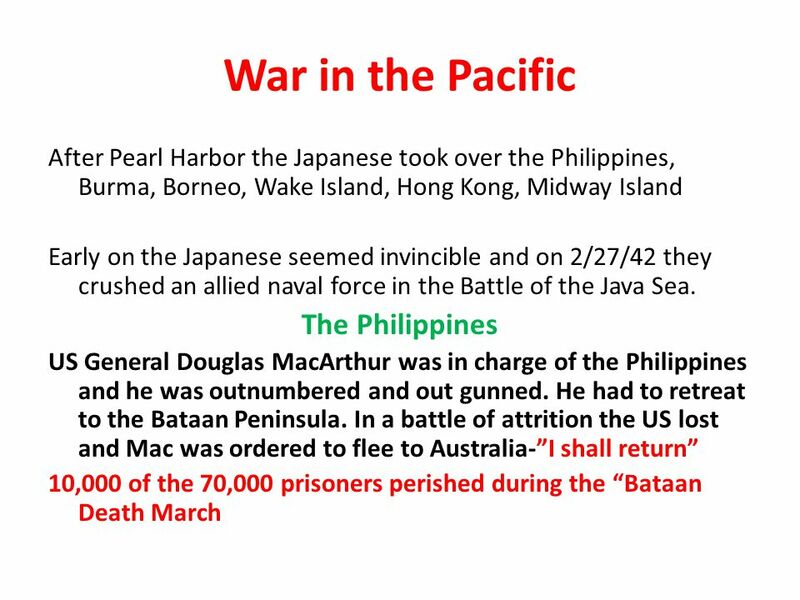 WORLD WAR II Pacific Campaign. 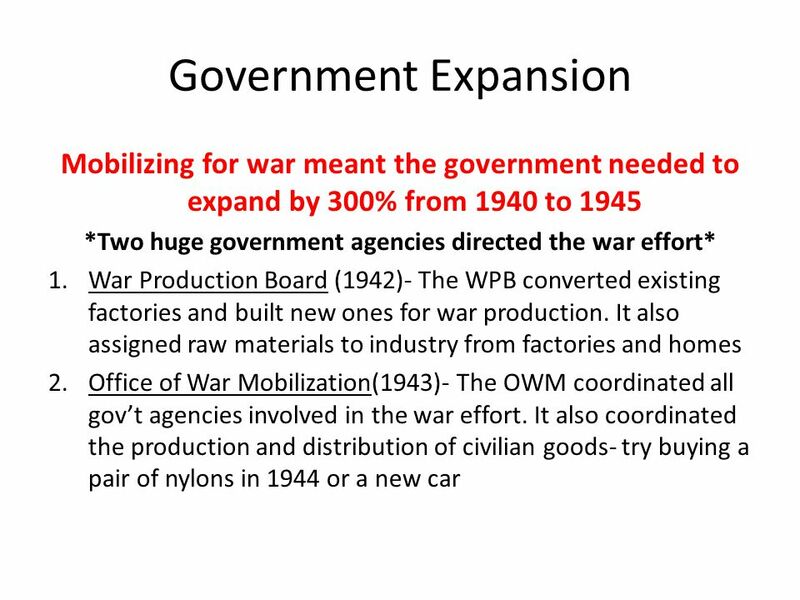 DISCUSS/REVIEW How did the United States get involved in World War II? The Cold War BeginsThe Allies Turn the Tide Section 1 Analyze the reasons for and impact of the Allies’ “Europe First” strategy. Explain why the battles. 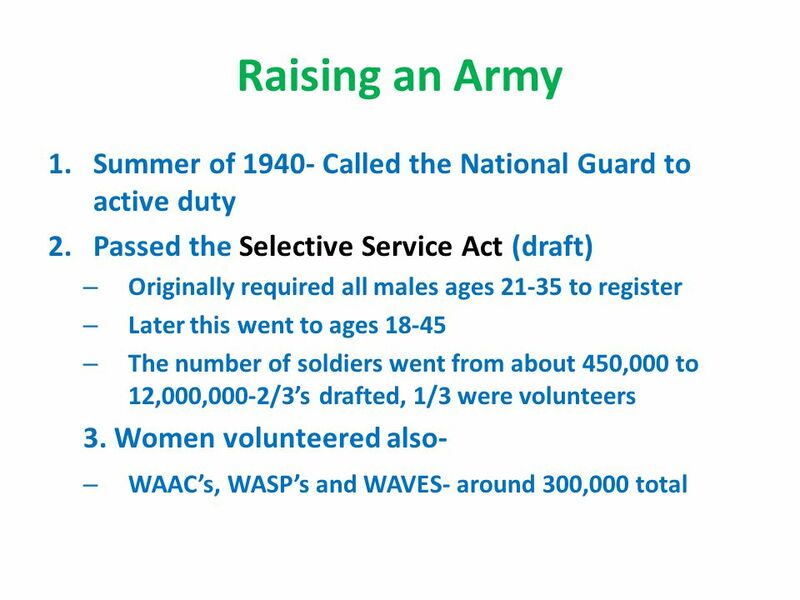 Turning Points in World War II Terms and People Dwight Eisenhower − American general and commander of Allied forces during World War II George S.
Objectives Understand how nations devoted all of their resources to fighting World War II. 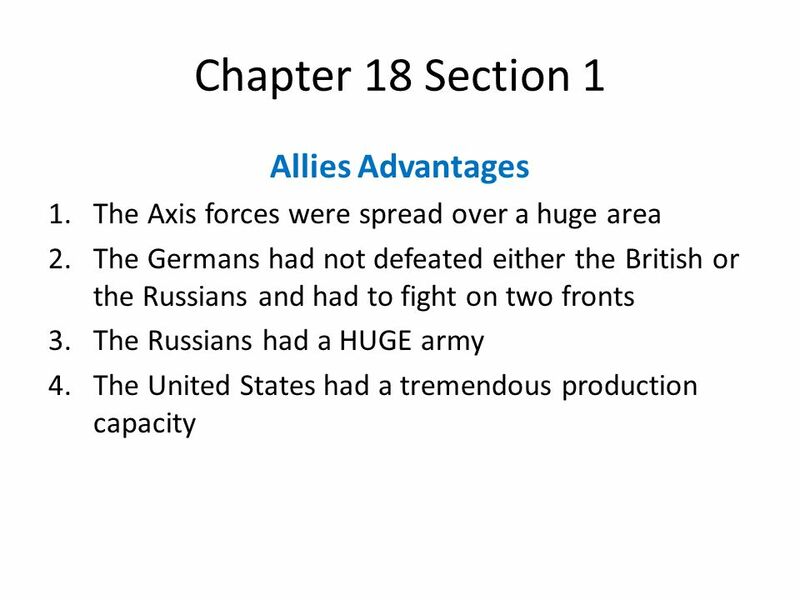 Explain how Allied victories began to push back the Axis powers. WWII Turning Points Japan controlled the Pacific Ocean Japan controlled the Pacific Ocean Japan controlled Hong Kong & the Malay peninsula Japan. 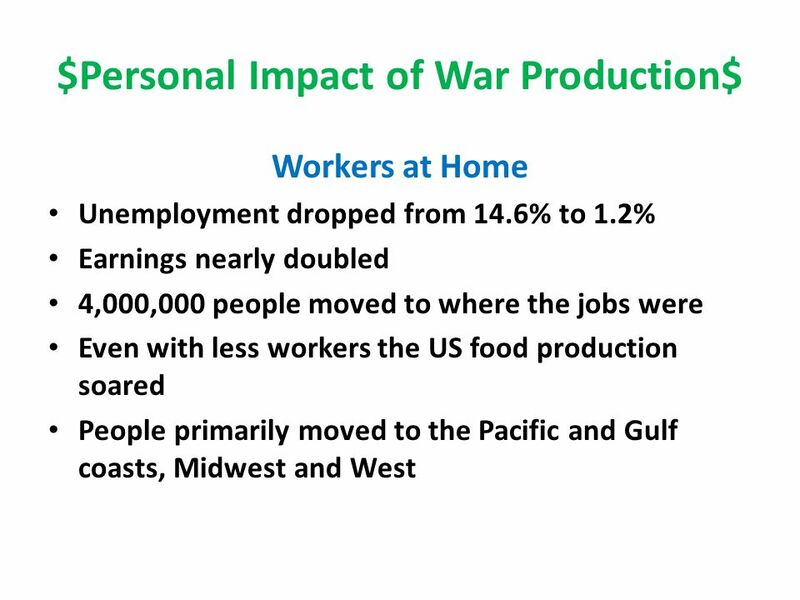 World At War After Pearl Harbor. Battle of the Atlantic Naval battle in the Atlantic Ocean between German Navy and the Allied forces of the British and. 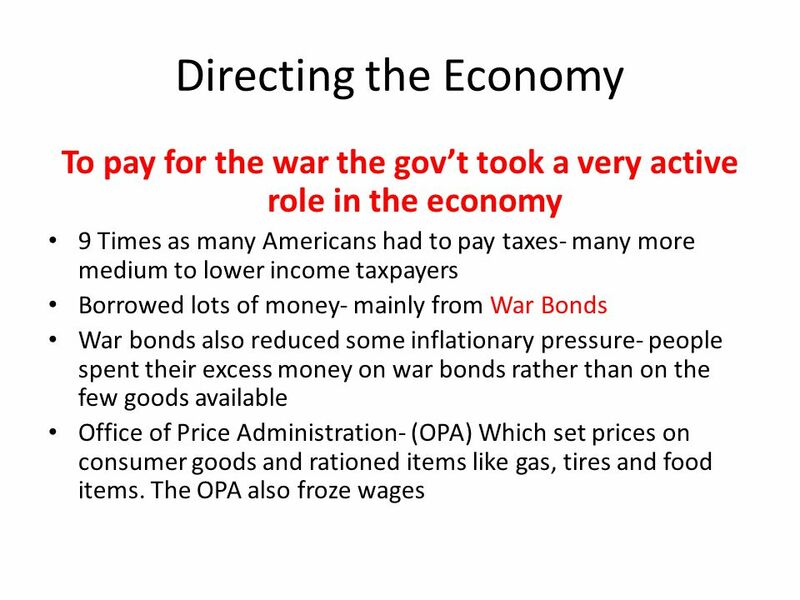 The Cold War BeginsAmerica Enters the War Section 3 Explain why Japan decided to attack Pearl Harbor, and describe the attack itself. Outline how the United. American Entry into the World War II. Terms and People Hideki Tojo − Japanese general and prime minister during World War II Pearl Harbor − American military. America Goes to War. Stopping Germany War on 6 fronts: North Africa Eastern Front North Atlantic China Southeast Asia Central Pacific. 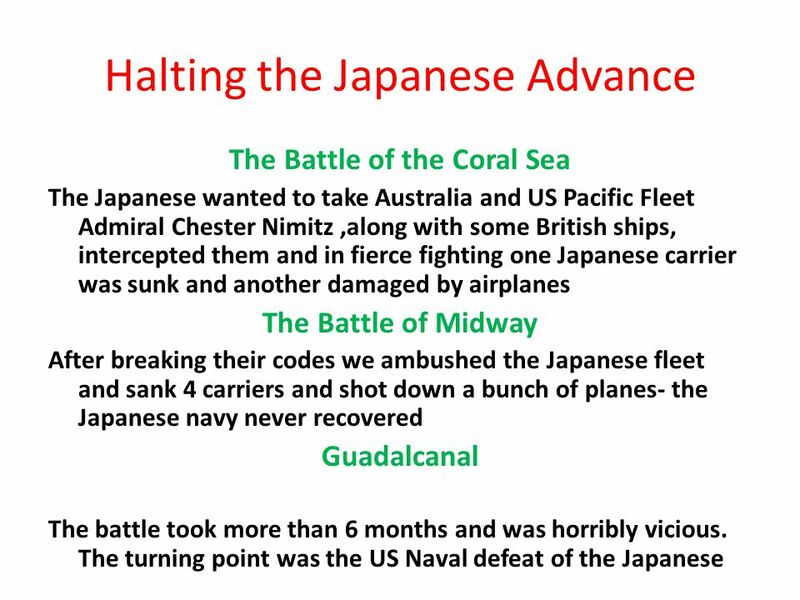 Chapter 16.2 Japan Strikes in the Pacific Chapter 16-2 Japan Strikes in the Pacific Kerry Casey, Crystal Campero, and Julie Boyle Mr. Schumacher Period. TEKS 8C: Calculate percent composition and empirical and molecular formulas. American Entry into the World War II. Thursday Warm-Up Use the political cartoon to answer the following questions in your warm-up section… 1. According the political cartoon, what was a concern.